If there was any worse place to fight than a jungle, it would be a swamp. The men who fought in the South Pacific often did both at the same time, since many of the coastal areas where combat took place were swamp grading into jungle. A swamp is an area of stagnant standing water, shallow enough to permit aquatic vegetation to flourish but deep and permanent enough to greatly hinder movement. Ecologists distinguish bogs, which are choked with organic matter such as peat; marshes, which lack organic matter and woody vegetation; and true swamps, which lack organic matter but have woody vegetation. These distinctions meant little to fighting infantry. Swamps are found wherever there is flat, inadequately drained terrain with heavy rainfall, which describes much of the coast of New Guinea and Sumatra as well as portions of Malaya. Arctic bog was common in the Aleutians, where low evaporation rates allowed water to accumulate. Arctic bog consisted of organic muck covered with a thin layer of vegetation. Many of the coastal areas of the south Pacific were mangrove swamps, where saltwater-tolerant mangrove trees grew into a mass of interlocking roots that trapped silt and debris. However, the rugged terrain of the Solomons meant that swamps were uncommon there, and they were also uncommon in the atolls of the central Pacific, except for isolated mangrove swamps. Swamps often had patches of higher ground that could support light traffic or fortifications. 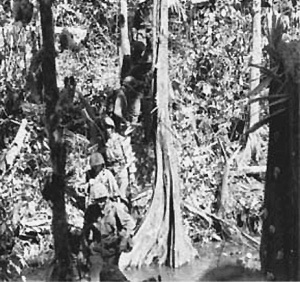 During the Buna campaign, the Japanese carefully arranged their field works to cover the few passable trails through the swamps south of Buna village, forcing Allied troops to fight under some of the worst conditions of the war. The misery of attempting to move through these swamps was exceeded only by the misery of trying to find cover in these swamps when one came under fire. High ground in swamps could sometimes be identified by the presence of kunai grass or breadfruit trees, which grew only on more stable ground. Swamps were ideal breeding ground for the mosquitoes that transmitted malaria and other tropical diseases. They were also infested with leeches, relatives of earthworms that attach to vertebrates (including humans) to take a blood meal. The wound caused by a leech could quickly become infected in tropical climates. More frightening were the saltwater crocodiles that inhabited coastal swamps throughout southeast Asia and were easily capable of killing a man. Though there were relatively few confirmed reports of Allied soldiers being attacked by crocodiles, it did happen. One victim was an Army captain at Cape Gloucester who lost an arm to crocodile attack while getting a drink from a river. It has been claimed, but is disputed, that as many as several hundred Japanese soldiers were killed by crocodiles while retreating from Ramree Island off the Burma coast. Engineers could sometimes construct corduroy roads, made of logs laid parallel, through swamps. These could take light foot traffic but were unpleasant for vehicular traffic. A proper road required either draining the swamp or building up a sufficient gravel base to raise the road above the water level. Both could be arduous tasks and engineers generally tried to find a way around the swamp instead.